When Dolby invited GoldenEar to join a select group of manufacturers who were being brought up to speed for their involvement in the upcoming introduction of Atmos for the home, we were very excited, as this was a very special honor. At a special, private CES meeting, Dolby explained the concept, execution and then presented their demo. We were sitting under a complex framework from which hung the four height channel speakers. It was quite impressive and immediately we started working, gears turning, figuring out how all this related to GoldenEar and how our speakers fit in. Dolby also presented an alternative concept, geared more for the mass market. If one didn’t want to put the height speakers on/in the ceiling, as was done with professional Dolby Atmos in the theaters, then there was another alternative involving bouncing/reflecting the height channels off the ceiling. We felt strongly that for first class home theaters of the sort that listeners would assemble with the best speakers, like GoldenEar’s, the decision would be clear that it was absolutely worthwhile going the preferred speakers-in (or on) -ceiling route, as was done theatrically. We felt that this would deliver a more precise and controllable sonic presentation for the height information, thus allowing the Atmos audio to better work its magic. And, perhaps most importantly, it would preserve the ability to choose the best possible main speakers, rather than be cubby-holed into a narrow choice of “enabled” speakers, with upward facing drivers, as the other solution entailed, or not having perfectly matched height modules. As we experimented with various setups and configurations, we were very enthused when we realized that both our Invisa architectural speakers and SuperSat satellite speakers, which superbly match all our other speakers, were perfect for the task. As we explored the possibility of developing “enabled” speakers or modules at a later date for the “bouncing sound off the ceiling” design, it became clear that this was not a good sonic solution at all. We felt pursuing the best and purist solution was right for GoldenEar and our customers and GoldenEar will not introduce a compromise product employing the “bounce off the ceiling” concept. Over the next year we formulated our plan for a demo during the Atmos public rollout, which was scheduled for CEDIA 2014. We decided that we would go through the trouble and considerable expense of outfitting a demo room on the floor of the show with a no-holds-barred system with the required four height channels, GoldenEar style. We decided that we would set up a 5.1.4 system, with Triton Ones in the front, Triton Twos in the back, with a four way split from the LFE-out into the LFE-in on all four Tritons, thus literally immersing the whole room in the LFE channel content. We chose a SuperCenter XL for the center channel duties, and four Invisa HTR 7000s as the ceiling-mounted height channels. All this was shooting from the hip, so to speak, as there was basically no way to experiment and actually try out our concept before the show, since decoders as well as program material were not available until our first day of CEDIA set up! Interestingly, when we discussed our plans with Dolby at CES and told them our plan to use our angled HTR 7000s in the ceiling (with the four of them just outside the prime listening area and all rotated so they were aimed right at the center of the prime listening area) their first response was that it wouldn’t work. We asked why and was told that it narrowed the sweet spot. But Sandy knew, from 40 plus years as a speaker guy, that angling in the speakers in the ceiling, as toeing in the speakers on the ground, would result in a bigger sweet spot, as well as smoother, more consistent coverage throughout the listening area. This also addressed the serious issue of “hot-spotting” that would occur with conventional in-ceiling speakers when used in any ceiling under 10′ in height. Needless to say, we were absolutely correct, as was later clearly demonstrated and proven when our demo was so wonderfully received (See Press Comments Link Below). We set up at CEDIA and somewhat tentatively popped in the provided Dolby Atmos demo disc and let it fly. WOW, it really sounded great!!! Luckily, two press folks, Darryl Wilkinson and John Sciacca, were around that afternoon before the show opened, for a quick listen and a sanity check. Big smiles and four thumbs up and we knew we were in business. A few tweaks followed just to dial it in perfectly. Clearly, our speakers and our concept of how to setup and integrate them together were very Atmos/DTS-X friendly and right on, as the press raves clearly proved. Click Here to read all the CEDIA 2014 Press Comments about the GoldenEar Atmos Audio Playback Demo. Our dealers were blown away, and perhaps most importantly, the folks from Dolby were equally impressed. In fact, after they were by to listen, we had a constant stream of industry dignitaries by who said, ”Dolby said I had to come by and hear your demo”. Almost all agreed the consumer-price-friendly GoldenEar home theater system for Atmos audio playback produced a superb, natural, totally three-dimensional soundfield, exactly as Dolby intended for this wonderful new audio technology for the home, which was probably the best at CEDIA. Following CEDIA, we have worked with many of our dealers in setting up their own demo rooms for this new technology, along the lines of what we did at CEDIA, and they all sound fantastic. No, all did not use 2 sets of Tritons. We just did one where the dealer used a pair of Triton Ones in a large, multi-seat theater. We did a public presentation there recently, showing off Atmos/DTS-X playback, and how well our speakers work for Atmos audio playback. Just for effect, we had a pair of ForceField 5s up front and on the stage next to the Tritons, but not plugged in. The bass was fantastic and listeners’ jaws dropped when we told the audience that the subs weren’t on. In that particular theater, we used Invisa MPXs as rear and side surrounds, HTR 7000 for front and rear height channels, in a 7.1.4 system. 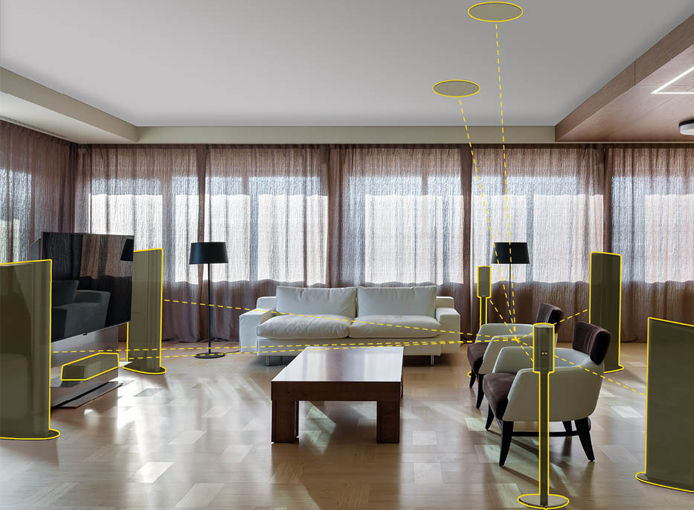 Please look at the diagrams below to see a typical installation using GoldenEar speakers. Note that in these examples we are showing Tritons up front with a SuperCenter XL, Invisa HTR 7000s in the ceiling, and either Tritons, SuperSats, or Invisa MPXs oriented vertically, for the rear and/or side surrounds. As we demonstrated at CEDIA, the additional rears are not necessary, and the 5.1.4 setup we demoed created a great experience. Also, although four height speakers are ideal, you can use just two to great effect, in a 5.1.2 installation, as shown, with the two height speakers in front of and to the sides of the main listening area. You can use any of our main speakers (Tritons, Aons, SuperSats or Invisas) as main or surround/rear speakers. You will need a subwoofer for maximum effect, unless you are using powered Tritons up front, and can certainly add additional subwoofers if you like. 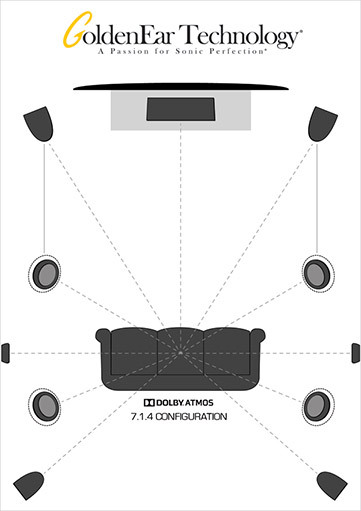 In terms of GoldenEar packages for Atmos/DTS-X setups, entry level would be a 5.1.2 package with SuperSat 3s all around, a ForceField 3 powered subwoofer and two Invisa 525s in-ceiling, or two SuperSat 3C on-wall (with SuperSwivel mount), height speakers at under $2250 US Retail (or under $2750 as a 5.1.4 system with four Invisa 525s/SuperSat 3Cs). A fantastic stealth Atmos 5.1.2 system with our 3D Array soundbar would be under $2500 (under $3000 as a 5.1.4 system with four Invisa 525s/SuperSat 3Cs). Of course, great systems can be assembled with our Aons too. The entry level systems with Triton Towers: a 5.1.2 system with Triton Sevens with a ForceField 3 (or Triton Threes), SuperSat 3 surrounds, a SuperCenter X and two Invisa 525 in-ceiling (or SuperSat 3C on-wall) height speakers at under $3100 (or under $3600 as a 5.1.4 system with four Invisa 525s/SuperSat 3Cs). And, of course, going all the way up to a system like we demoed at CEDIA at under $11,000, with many mix and match steps in between. Your GoldenEar dealer can help you create the ideal GoldenEar home theater for Atmos/DTS-X playback to fit your budget and your room. With the transition to object-based surround sound playback (Atmos, DTS-X, etc. 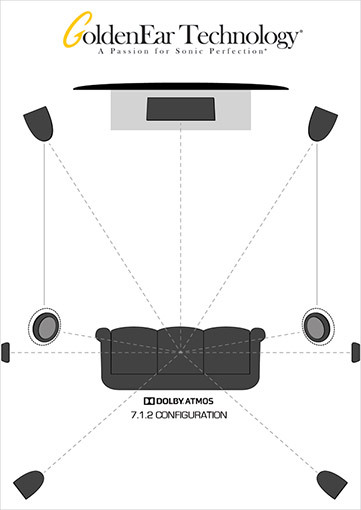 ), the positioning of speakers used in a home theater setup has changed. Now the main AND surround speakers should be at ear level and not ceiling mounted, leaving the ceiling for the 2-4 height channels, to complete the 360 degree sound bubble. (Of course, an exception to this is that very special in-ceiling speakers, like our Invisa HTR 7000s that do an excellent job of ear level imaging, can actually work well in these roles, as they project the sound image in such a way to appear to becoming from in front, not from above, with proper setup and listening distances.) Since many existing theaters may have in-ceiling speakers already installed as surround channels, a re-wiring of these as height speakers, with the addition of on-wall or in-wall ear-height surround/rear speakers, could be the perfect upgrade solution along with that new Atmos/DTS-X/etc.-capable receiver or pre/pro. Yes, there is a brave new world of incredible audio excitement waiting to be discovered. Esta entrada fue publicada en Novedades y Articulos el 22 enero, 2019 por admin.